The Arthur C. Clarke Award is the most prestigious award for science fiction in Britain. It is becoming recognised as one of the most prestigious science fiction awards in the world, the equivalent of the Booker Prize. It is awarded every year to the best science fiction novel which received its first British publication during the previous calendar year. The Award is chosen by jury. The Award was established with a generous grant from Arthur C. Clarke with the intention of encouraging science fiction in Britain. The Award was set up in 1986 and the first winner was announced in 1987. The award consists of an inscribed plaque in the form of a bookend, and a check the amount of which is equal to year of the award. 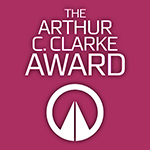 The Arthur C. Clarke Award is judged by a jury which consists of five judges, two representatives each of the BSFA and the Science Fiction Foundation, and one representative of the Science Museum. The panel of judges changes every year. Since the Award was established in 1986, many of the most distinguished writers, critics and fans involved with science fiction in this country have acted as judges. Among those who have judged the award are Arthur C. Clarke Award winners Gwyneth Jones, Geoff Ryman and Paul McAuley, distinguished authors Mary Gentle, John Gribbin, Neil Gaiman, David Langford, Kim Newman, Lisa Tuttle and Ian Watson, and critics John Clute editor of The Encyclopedia of Science Fiction, David Pringle former editor of Interzone, Edward James former editor of Foundation, Farah Mendlesohn current editor of Foundation, Andy Sawyer administrator of the Science Fiction Foundation, Maureen Speller former administrator of the British Science Fiction Association, Maggie McDonald review editor of New Scientist, Dr David Seed of Liverpool University and author of books on Thomas Pynchon among others, Maurice Goldsmith author of numerous books on science and scientists and Roz Kaveney contributor to the Times Literary Supplement and numerous other journals. The chairman of the judges and administrator of the Award is Paul Kincaid, author of What It Is We Do When We Read Science Fiction, and contributor of reviews and articles to numerous books and journals.